Openers and Springs - from adjustments and troubleshooting to emergency repairs! Everybody needs some guidance every now and then. Guess what? Your garage door is no different. It uses a system of tracks to help facilitate its movement in a smooth and stable way. Naturally, that doesn’t mean that problems can’t occur. Bent tracks have long since been the cause of all sorts of common garage door problems. They can see you struggling with a garage door that won’t open or close due to a blockage, or they can cause the door to make a lot of noise while moving. 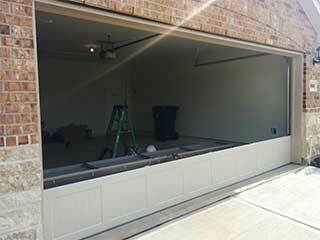 That’s where Garage Door Repair Yonkers can offer a helping hand. When faced with such problems, you’ll want to have a professional assist you. Garage door track repair, when done correctly, can be fast and effective. When performed by amateurs however, the results won’t be so desirable. What Do Garage Door Tracks Do? It’s a fairly simple question with a fairly straightforward answer. The tracks guide the door, of course. Your overhead garage door has rollers on each side, and these wheels move inside the tracks and thus ensure that the door rises and lowers steadily without sliding to the sides all of a sudden. The tracks keep the rollers in place and prevent such issues. However, when the tracks warp or bend, they can prevent the rollers from moving. At which point, garage door track repair will be a necessity. Repairing a bent garage door track or replacing it requires skill and experience. Simply banging on the metal with a hammer until it’s ostensibly straightened isn’t enough. You need to use a level to ensure it’s perfectly straight and that the metal hasn’t bent at a different part of the track as a result. You also need to ensure the rollers can move smoothly afterwards, and that the tracks are clear of any debris and aren’t full of rust. And that’s without even discussing the complexity of track replacement. Improper sized sections or tracks that are misaligned will create a whole host of problems. Not to mention, they’ll probably make your door’s movement incredibly noisy. Avoid complex and potentially dangerous DIY. Simply contact Garage Door Repair Yonkers and let the nearest and most experienced technicians handle all your track service needs. Whether it’s some minor realignment or complete track replacement that you require, you can rely on our team to complete the job quickly and safely.